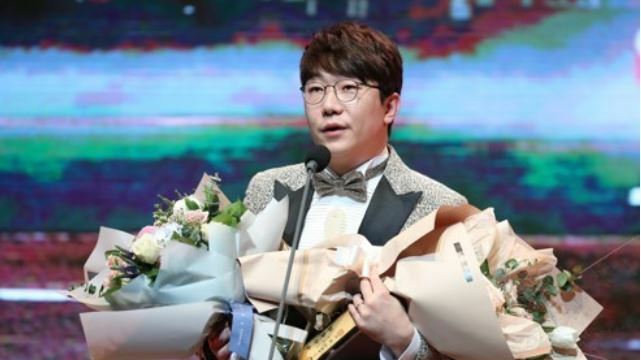 The reigning South Korean baseball MVP Yang Hyeon-jong picked up another major trophy on Wednesday, completing an unprecedented sweep of the sport's top individual awards. The Kia Tigers left-hander was one of 10 recipients of the Golden Glove in the Korea Baseball Organization, as he capped off the most memorable season of his 11-year career. Yang won a whopping 323 out of 357 votes cast by baseball writers, photojournalists and broadcasters. Yang won the regular season MVP award last month, after tying for the KBO lead with a career-high 20 wins and ranking fifth with a 3.44 ERA. And in late October, Yang was voted the MVP of the Korean Series, the KBO's championship final, for helping the Tigers beat the Doosan Bears in five games for their first title since 2009. Yang threw a complete game shutout in Game 2 and pitched a scoreless ninth inning for a save in the clinching Game 5. The 29-year-old is the first KBO player to sweep both MVP awards and a Golden Glove in one season. This was also Yang's first career Golden Glove. Yang's teammate, Hector Noesi, was the only other pitcher to even reach double figures in votes with 12. Noesi also won 20 games but had a slightly worse ERA than Yang at 3.48. The nine other awards went to eight position players and one designated hitter. Despite the name's connotation, Golden Gloves are usually presented to players who put up the best offensive and pitching numbers, instead of the best defensive players. League leaders in major offensive and pitching categories all earned automatic nominations. Starting this year, the KBO included defensive innings played among the qualifications, which expanded the pool of nominees and brought defensive contributions into consideration. For the DH category, all players who appeared as DH in at least two-thirds of the minimum at-bats to qualify for the batting title (297 at-bats) were automatically nominated. For pitchers, anyone who threw the minimum innings for the ERA title, 144, was up for the Golden Glove. Also, a pitcher who met one of the following criteria -- 10 or more wins, 30 or more saves and 30 or more holds -- was nominated as well. 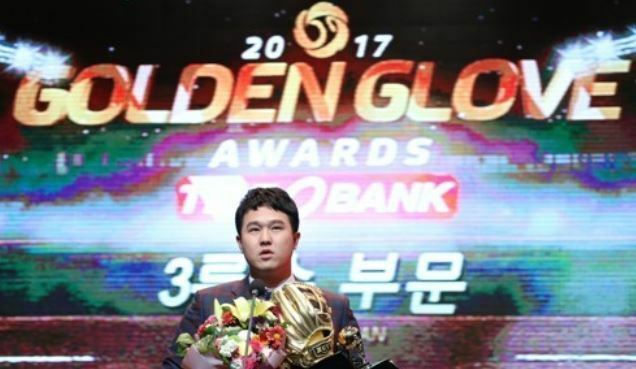 SK Wyverns third baseman Choi Jeong, the runner-up to Yang in the regular season MVP voting, picked up his fifth Golden Glove at a hot corner in a landslide. Choi swept up 326 votes, with the Tigers' Lee Bum-ho a distant second with just 19 votes. Choi was the regular season home run king with a career-high 46 long balls and finished fifth in RBI with 113. Lee Dae-ho of the Lotte Giants grabbed his fifth Golden Glove in his first season back in the KBO after five years split in Japan and the United States. The former Seattle Mariners first baseman earned 154 votes to beat Wilin Rosario of the Hanwha Eagles by 36 votes. Lee smacked 34 home runs and knocked in 111 runs while slashing .320/.391/.533 and led the Giants to their first postseason since 2012. Rosario posted better numbers across the board than Lee -- he batted .339/.414/.661 with 37 home runs and 111 RBIs -- but the Eagles missed the postseason for the 10th consecutive year. Kia Tigers second baseman An Chi-hong won his second Golden Glove, his first since 2011. This was the closest battle in the infield, with An beating Park Min-woo of the NC Dinos by 140 to 134 in votes. An led all second basemen with career highs of 21 home runs and 93 RBIs. Park finished third in the league with a .363 batting average but only played in 106 games, 26 games fewer than An, and didn't put up quite the power numbers. An's double play partner on the Tigers, shortstop Kim Sun-bin, claimed his first Golden Glove. Kim, the shortest everyday player in the KBO at 165 centimeters, was the batting champion with a .370 average. He garnered 253 votes. Nexen Heroes' Kim Ha-seong, who led all shortstops with 23 home runs and 114 RBIs while batting a career-high .302, earned just 86 votes to finish second. The three outfield winners were: Son A-seop of the Giants and Choi Hyoung-woo and Roger Bernadina of the Tigers. Son topped all outfielders with 224 votes, followed by Choi with 215 and Bernadina with 190. Son, who grabbed his fifth Golden Glove, led the KBO with 193 hits. The 29-year-old also enjoyed his first 20-20 season, with 20 home runs and 25 steals. Choi won his second straight Golden Glove and his fifth overall. In his first season with the Tigers, Choi ranked second in the KBO with 120 RBIs and sixth with a .342 batting average. Choi also hit 26 home runs for his fourth straight year with at least 20 homers and 100 RBIs. In his first KBO season, Bernadina had 27 homers, 111 RBIs and 32 steals, and was the only foreign player to hit for the cycle this year. Kang Min-ho of the Samsung Lions won his fifth Golden Glove as catcher. Playing for the Giants in 2017, Kang led all backstops with a .280 batting average, 22 home runs, 68 RBIs and 22 doubles. Kang signed a free agent deal with the Lions last month, and is the seventh player to win a Golden Glove after switching teams via free agency in the same offseason. Kang picked up 211 votes, while Yang Eui-ji of the Doosan Bears, the winner of the past three Golden Gloves, was a distant second with 68. Park Yong-taik of the LG Twins won his first Golden Glove as DH. He'd won three as an outfielder in 2009, 2012 and 2013. At 38, the ageless wonder batted a robust .344 while matching his career high with 90 RBIs. He played in 138 of the team's 144 games.